The aim of the present work is to present the development of a computational two-way coupled (fluid and particle coupled) magnetic nanoparticle targeting model to investigate the efficacy of magnetic drug targeting (MDT) in a patient-specific diseased left carotid bifurcation artery. MDT of therapeutic agents using multifunctional carrier particles has the potential to provide effective treatment of both cancer and cardiovascular disease by enabling a variety of localized treatment and diagnostic modalities while minimizing side effects. A computational model is developed to analyze pulsatile blood flow, particle motion, and particle capture efficiency in a diseased left carotid bifurcation artery using the magnetic properties of magnetite (Fe3O4) and equations describing the magnetic forces acting on particles produced by an external cylindrical electromagnetic coil. A Eulerian–Lagrangian technique is adopted to resolve the hemodynamic flow and the motion of particles under the influence of a magnetic field (Br= 2T). Particle diameter sizes of 20 nm–4 μm in diameter were considered. The computational simulations demonstrate that the greatest particle capture efficiency results for particle diameters within the micron range, specifically 4 µm in regions where flow separation and vortices are at a minimum. It was also determined that the capture efficiency of particles decreases substantially with particle diameter, especially in the superparamagnetic regime. Particles larger than 2 μm were targeted and captured at the desired location by the external magnetic field, and the largest capture efficiency observed was approximately 98%. 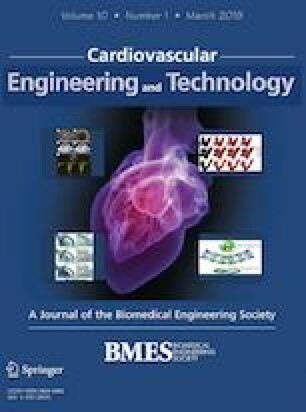 The simulation results presented in the present work have shown to yield favorable capture efficiencies for micron range particles and a potential for enhancing capture efficiency of superparamagnetic particles in smaller arteries and/or using magnetized implants such as cardiovascular stents. The present work presents results for justifying further investigation of MDT as a treatment technique for cardiovascular disease. The authors would like to acknowledge Dr. Moloy Banerjee from the Future Institute of Engineering and Management Department of Mechanical Engineering in Kolkata India. Dr. Banerjee provided a great deal of insight and advice on developing the user defined function used in this work to describe the magnetic field produced by the external cylindrical coil. The authors would also like to acknowledge the University of North Carolina at Charlotte (UNC-C) Faculty Research Grant (FRG) and the Wells Fargo Faculty Grant through the Charlotte Research Institute (CRI) which funded this work. Lastly, the authors would like to acknowledge the North Carolina Space Grant Graduate fellowship through the National Aeronautics and Space Administration (NASA) which provided summer funding for the graduate student (Ashley Ciero) to work on this research. The authors of this work declare no conflict of interests. No human studies were carried out by the authors for this article.